PayPal Casinos - How to play Online whit this option? PayPal has become a well-known and trusted name in internet retail. Millions of users from around the world use the service daily to make purchases, or sell goods. It only makes sense that a lot of today’s online casinos also offer this service as an optional payment method. We looked into what funding an online casino account using PayPal is actually like, and which casinos offer this payment method. If you’re considering using PayPal as a payment method for online casino gaming, then hopefully this article will answer some questions you may have about this service. More and more online casinos are deciding to add PayPal to the payment methods they offer their players. There are a number of reasons for PayPal’s popularity, but in the case of online casinos, the advantage is that if you already have a PayPal account, making a deposit can be done almost instantly. PayPal is an online money transfer solution. Over the years PayPal has achieved a reputation for being the safest and easiest way to make or receive payments online. The service can be used by almost anyone to make payments online using a computer or mobile device. The security of the service rests on the fact that financial information is not shared between the buyer and seller, but that’s just the beginning. The PayPal system also utilizes a number of additional security measures to prevent fraud. The flexibility of PayPal means you can add a number of payment sources – credit cards, bank accounts – to your PayPal account. Then, when you want to make a transaction, you choose which payment source to use. This works the same way for funds you are receiving. For online casino use, this is great because your winnings are immediately deposited back into whichever account you choose and once that’s done, the money is accessible to use for other online purchases. Choose the type of account you’d like to open; either a “Personal” or “Business” account. Select “Canada” in the country field. Choose a password and click “Continue”. Click to confirm you’ve read the “User Agreement”. Once you’ve completed these steps, an email will be sent to your inbox for confirmation. Just follow the steps in the email to approve your account. You can use PayPal as an e-wallet or you can go into your PayPal account and add payment sources like credit cards or bank accounts. You can also do this at a later stage – when you actually want to make your first payment, the system will prompt you to enter the details of whichever payment source you choose. PayPal can hold a number of payment sources and you can decide what to use when. This works in a similar fashion for withdrawals – you can decide where you want your withdrawn funds to be deposited. To use PayPal at an online casino, you will First need to fund your PayPal account or link it to a credit card or bank account. Once you’ve done this, making a deposit at the casino is easy. On the deposit page of the casino, select PayPal. 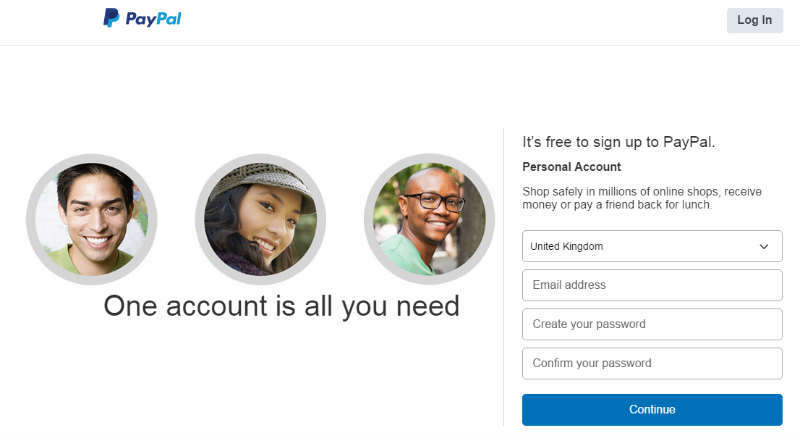 You’ll be asked to log in with your PayPal account information. Now you can fund your casino account. In a matter of minutes you should receive a confirmation message from the online casino that your deposit has been successfully processed. To make a withdrawal, just select PayPal on the casino’s withdrawals page. Then, log in using your PayPal account information and approve the withdrawal. You won’t believe how quick and easy this process is. Once you’ve done it a number of times, it will be second nature. Transferring money on the internet can expose you to all kinds of security issues. PayPal has an official European banking license and enlists a number of measures to make transfers as secure as possible while protecting the user’s personal information. Most online casinos offer a range of e-wallet options. What makes PayPal particularly useful is that once your account is set up, you could use it for doing all kinds of transfers, not just those at the casino. After a good session at the blackjack table, you could browse directly over to your favorite online store and make a purchase. Making payments using PayPal is a very fast process. Once you’ve chosen the product you wish to purchase, or in this case the casino you wish to deposit at, the money is immediately transferred and you’ll be able to see it in your casino account right away. It’s amazing that a service as revolutionary as PayPal is offered to users completely free of charge. The PayPal system was created in a way that the sellers are charged fees for transactions, not buyers. So besides the actual money that you’re transferring for your purchase or deposit, no ther fees will be deducted from your account. PayPal has earned its status as the household name for making purchases online. This reputation definitely carries over to use by online casino players. The service is very streamlined and will suit the needs of all kinds of players. Once you’ve set up your account and added a payment source, making deposits or withdrawals from any PayPal-supported casino will be a breeze while still being secure. We definitely recommend PayPal as a payment method for use at online casinos.